Under Contract in 12 Days! Come see this beautiful updated and moved in ready 4 bedrooms, 2 baths, ErnieWhite NORTHSIDE POOL home with new septic drain fields in 2017, all new carpeting in bedrooms in 2016, new privacy fence in 2016, new roof and energy efficient windows in 2012, resurfaced pool and newly pavered patio deck in 2010 . This split plan home sits on .35 acres in the well established Timberidge community. The backyard is fenced in for pets/privacy and has a fire pit area and there is even a 250 sq ft shed for either storage or a workshop for the handy person in the family. Off the foyer there is a Large Formal Living Room/Office. The kitchen has been updated with beautiful wood cabinets, stainless appliances, solid surface counters, large walk in pantry, and utility room for laundry. The dining room overlooks the pool and is opened to kitchen. There is a large family/great room off the kitchen with vaulted ceilings and large windows. The large master suite has room for a king size bed and has french doors that lead to large screened in pool area and shaded entertainment area for relaxing, dining and socializing. The master bath was newly renovated with new vanity and dual sinks and large walk in shower. There are 3 other bedrooms located on the other side of the home to provide plenty of privacy. 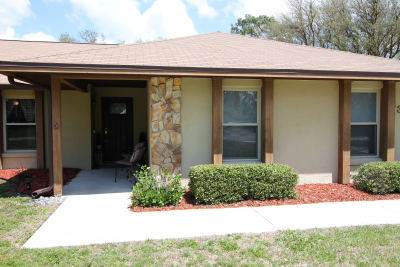 Enjoy living on the north side conveniently minutes away from I4. No HOA.